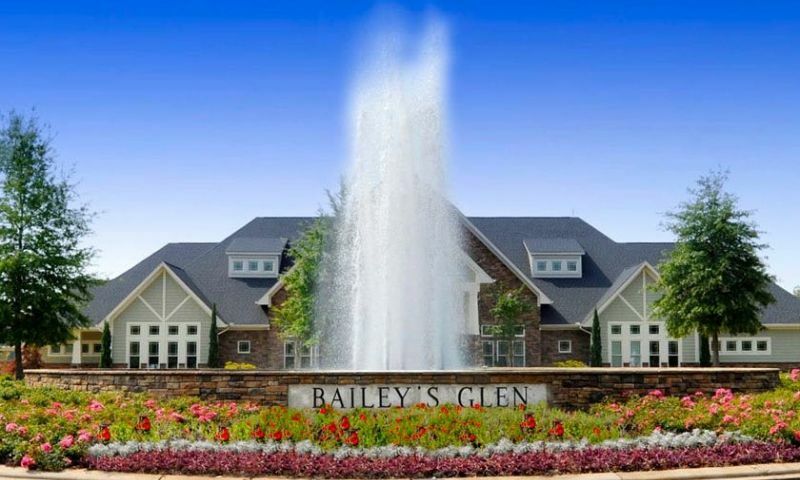 Bailey's Glen is an active adult community situated on 145 acres just 20 minutes north of Charlotte in Cornelius, North Carolina. This community offers new homes by South Creek Homes in 18 different floor plans. Buyers are able to personally select paint colors, carpets, and more. Plus, many of the standard features provided by the builder include more upgrades than other comparable communities in the area. With a planned total of only 670residences divided between 545 single-family homes and 125 luxury condos which will be completed in a future phase, this community will remain intimate and keep its neighborly charm. Bailey's Glen is in an established neighborhood and borders Bailey Park, only a few miles away from desirable Lake Norman. The on-site amenities include a brand new clubhouse and a full-time activities director. The focal point of activity in Bailey's Glen takes place at the 12,000 square-foot clubhouse called The Meetinghouse. It houses an exercise with aerobics studio, five hobby and game rooms, a resident library, computers, billiards, and a ballroom. Outdoors, residents have full use of two swimming pools, outdoor pavilion with grilling area, pickleball courts, bocce ball courts, tennis facilities, putting green, and horseshoe courts. The grounds also include a dog park, a gardening area, and pocket parks. Residents can walk to Bailey Park, which offers additional activities and recreation such as basketball, softball, an amphitheater and more. South Creek Homes started construction at Bailey's Glen in 2006. The community will eventually be home to an estimated 372 single-family homes in 19 ranch-style floor plans that can be modified with custom products and features. There are four model collections available ranging in size from 1,294 to 3,100 square feet. The first is the Cottage Collection and offers three bedrooms and two or three bathrooms among three styles. Homes in this collection have great rooms, fireplaces, owner suites with his and her closets, and rear patios. The second series is called the Village Collection and is comprised of nine styles. They offer two to three bedrooms and two baths. Features include foyers and front porches with columns. The third collection offers four floor plans and is called the Classic Collection with three bedrooms and two baths. Homes in this series include fireplaces, large walk in closets in the master suites, formal dining areas, and outdoor covered patios. The largest collection, the Premier Collection, offers the finest appointments in homes with three bedrooms and two or three baths available in five different floor plans. Features include formal living and dining rooms, great rooms, luxury master baths, fireplaces, covered porches, and hobby spaces in the garages. All homes at Bailey's Glen in Cornelius have two-car garages and inviting front porches. Residents of Bailey's Glen enjoy resort-style amenities and quality construction with plenty of flexibility to personalize their homes. Combined with the region's mild temperatures situated in the backyard of Charlotte's premier resort area makes Bailey's Glen the perfect retreat for active adults. Since full lawn care is included with each home, residents have plenty of time to enjoy life. From shopping and travel excursions to wine tastings and weekend getaways, Bailey's Glen is a very active community. Residents can also join existing social clubs like arts and crafts, kayaking, pickleball, and bridge; or start new ones with the help of the on-site lifestyle director. Residents also participate in photography classes, movie nights, a theater club and more. Bailey's Glen is located about 20 miles from uptown Charlotte, North Carolina - adjacent to Bailey Park. It is only a mile to the villages of Huntersville, Cornelius, and Davidson. The Northlake Mall and the Concord Mills Malls are within a few minutes driving distance. There are also several golf courses nearby. The main attraction however has to be Lake Norman, only three miles away, where residents can enjoy 500 miles of shoreline and go kayaking, canoeing, fishing, and power boating. Some other places of interest in the Cornelius area are Jetton Park, Ramsey Creek Park, Vineyard Point, and the Tom Clark Museum. The Charlotte-Douglas International Airport is less than half an hour away and makes long distance travel very convenient. Active adults enjoy living a vibrant lifestyle with low-maintenance homeownership in Bailey's Glen, a 55+ community in North Carolina. The Meetinghouse - 12,000 Sq. Ft. There are plenty of activities available in Bailey's Glen. Here is a sample of some of the clubs, activities and classes offered here. There are three floor plans offered in the Cottage Collection. These single-family homes range from 1,273 to 1,443 square feet in size with two or three bedrooms, two bathrooms, and an attached two-car garage. These homes feature dens that can be used as an extra entertaining space or third bedroom. The Village Collection of single-family homes offers seven floor plans with 1,428 to 2,119 square feet of living space. These homes offer two to three bedrooms, two or three bathrooms, and an attached two-car garage. There are three floor plans in the Classic Collection. These homes offer three bedrooms, two or three bathrooms, and an attached two-car garage with 2,004 to 2,153 square feet for living space. The Premier Collection offers the largest home plans with 2,248 to 2,409 square feet of living space with three bedrooms, two or two-and-a-half bathrooms and an attached garage. The Oasis at Bailey's Glen are comprised of six condominium plans that range in size from 1,295 to 1,584 square feet. They offer one or two bedrooms, and one-and-a-half to two-and-a-half bathrooms. There are options for pool-side location and garage or underground parking per unit. We built a new home here and the whole experience was great. The construction went smoothly, the builder was easy to work with and we really love our home. The community is really well run and maintained nicely. We have met some great people and enjoy having so many options of things to do. We stay busy yet still have to time just sit back and relax. After searching for some time for the right place to live and be near to one of our children, we settled on Bailey's Glen. The primary reasons for this decision were due to Bailey's Glen being a newly developed Active Adult Community with an already established clubhouse which includes a fitness center, club, craft and meeting rooms, pool, tennis, bocce ball, pickle ball, putting green, etc. For all of these reasons, it is anticipated that establishing new friends and neighbors will be relatively easy. Our house is now under construction with an anticipated relocation from FL during the summer of 2012. 55places.com is not affiliated with the developer(s) or homeowners association of Bailey's Glen. The information you submit is distributed to a 55places.com Partner Agent, who is a licensed real estate agent. The information regarding Bailey's Glen has not been verified or approved by the developer or homeowners association. Please verify all information prior to purchasing. 55places.com is not responsible for any errors regarding the information displayed on this website.